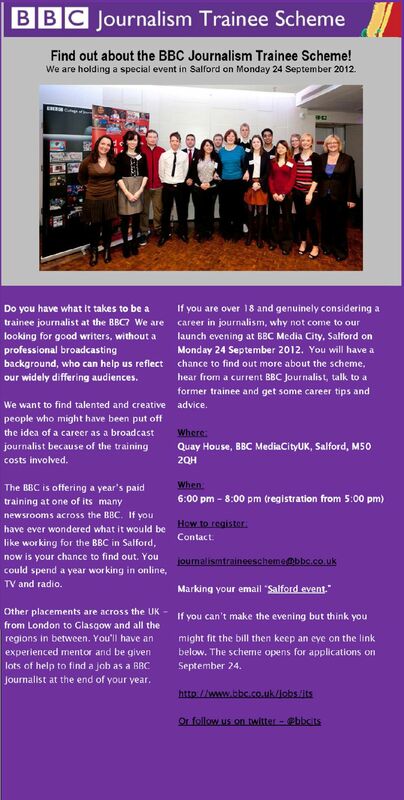 Applications for the 2013 BBC Journalism Trainee Scheme will open on September 24th with a launch event to be held at Media City in Salford. See the poster below for details of how to register to attend the launch event. We are more concerned with your talent, potential and passion to achieve great things with us than with your academic background. With regards to the scheme itself, places are limited and competition will be fierce so you’ll want to stand out from the crowd. The scheme might not have opened to applications yet but it’s never too early to start putting yours together or to seek out any additional opportunities to get examples of your work out there that you can include in your application.